The Greens have always attracted the voter that prefers to eat pesticide free, organic food and have a history of being against GMOs ( genetically modified foods). The Greens have supported the March against Monsanto for many years and their website clearly states their policy on GMOS. However Greens leader Richard Di Natale stated this year that he wants to soften the policy on genetically modified crops,and claims the argument lacks evidence. “Soften the policy’ in political speak means that Richard Di Natale wants to start supporting the production of more GMO crops, this is ironic as I received most of my education on the dangers of GMOs from the Greens Party. Another contradiction from the Greens is their support of the controversial Safe School program which on their website theyclaim is an essential program that supports young people and aims to end homophobic and transphobic discrimination and bullying at school. However, many people see Safe Schools as not just an anti bullying program but state sanctioned abuse, sexualisation and social engineering of children. The Australian Green Party have morphed from the tree loving party who want a nice environment into a hybrid of socialism and fascism who advocate radical politics and social engineering policies. If you doubt their extreme leftist nature, you just need to read their policy pages on their website . The Greens believe in radical globalism, with a heavy emphasis on unelected and unaccountable bodies like the UN .In their section on Global Governance in principles they say “The leading role of the United Nations in the maintenance of international peace and security must be recognised and respected by all countries.”This smacks of Agenda 21. In addition to their litany of contradictions, it is very clear that the Greens are now against health freedoms & freedom of choice in regards to vaccination issues. The Greens have alienated some of their initial support base of earth loving health conscious non toxic voters. Many initial greens supporters who care about healthy living and don’t want pesticides, GMOs in their food had children. Much to the horror of the Greens leadership, many of the new generations also care about what’s being injected into their children & are now questioning this. Many have valid concerns about the effects of vaccines & the ingredients going into them such as, formaldehyde, aborted fetal & animal cell line components along with DNA, aluminum, polysorbate 805, genetically engineered yeast, MSG, antibiotics and animal viruses being injected into their children. Many of these people have made the informed & well researched decision that the risks of vaccines far outweigh the benefits. Senator Di Natale openly supports pro vaccination hate groups such SAVN ( Stop the Australian Vaccination Network) and Australian Skeptics. At a parliamentary speech in June 2013, Senator Richard Di Natale personally thanked thugs from Australian Skeptic group, Stop the AVN ( AVN) who have the daily job of inciting hate and discrimination against non vaccinating families. These thugs have plenty of time on their hands and many seem to be paid internet trolls. They have a history of sending death threats, making complaints, preventing talks by Vaccine choice activists, name and shame tactics on social media along with cyber bullying anyone who has the audacity to question the safety and advocacy of vaccines. 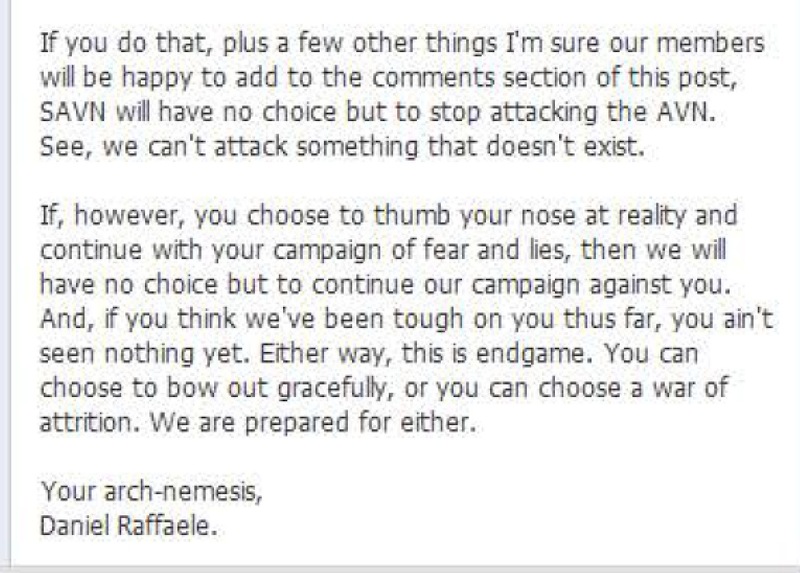 Senator Di Natale thanked SAVN facebook page founder, Daniel Raffaele who made death threats and phone calls against AVN founder, Meryl Dorey. You can hear the threatening phone calls made from the house of Daniel Raffaele to Ms Dorey in the video below. Di Natale also thanked Skeptic thug, Peter Bowditch who has harassed mothers of vaccine injured kids and asks them if they have orgasms over dead children along with, Ken McLeod who has posted the home address of Meryl Dorey, urging his hate filled followers to dump toxic waste at her home. Considering the Greens party advocates a lot of social justice and non discriminatory behaviour, the support of Skeptic hate groups clearly contradicts everything they stand for. SAVN can present their work at the Public Health Association of Australia – PHAA vaccination conference, Skeptic Tracey McDermott presented papers on “We don’t do false balance”; how SAVN contributed to a change in vaccination reporting” and the other “Evidence suggests the fall of the professional anti-vaccination movement in Australia” SAVN called members of the citizen group, Australian Vaccination Skeptics group “ professional activists” The groups consist of concerned citizens who are very passionate about retaining their right for freedom of choice over vaccination related issues along with parents who are caring for vaccine injured children. The Greens state clearly on their website a need for independent regulatory bodies and transparency in Pharmaceutical matters, such as. 8. A properly resourced Pharmaceutical Benefits Scheme free from political interference. 9. The membership of regulatory bodies, such as the Pharmaceutical Benefits Advisory Committee, to be made up of independent scientific experts, clinically-based health care advisors and consumer representatives, in order to provide independence from undue influence. However this is an example of more hypocrisy occurring in the Greens party & by supporting the No Jab No pay policy, we can see this is based on pharmaceutical conflict of interests. The Daily Telegraph which is owned by Rupert Murdoch, who has strong ties to GSK and his son James even served on the board of the Drug Corporation. Even though Human rights activists believe No Jab No Pay to be a form of duress, which, for some families, is substantial enough to challenge their free will and true consent. The No Jab, No Pay amendment violates numerous international human rights agreements and long-held rules by medical oversight bodies. Gone are the earthy values of the Green party & for those who supported the Greens for being that clean alternative party, those days are over. Do not vote for the Greens if you care about health freedom & freedom of choice! Will you vote for a party that doesn’t support human rights and praises hate groups to carry out abuse and even death threats against hard working families who simply choose not to vaccinate? Voting for the Greens is a vote for the removal of your god given right to choose what you think is best for your family & yourself, it’s a vote for medical tyranny & the loss of health freedoms in Australia. 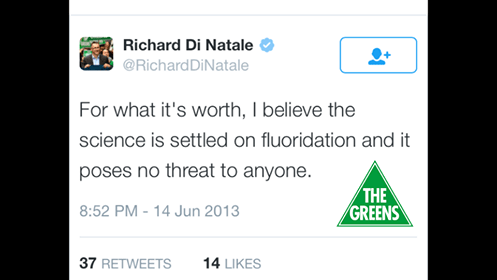 2 Responses to Why Richard Di Natale and the Greens are dangerous ?